There's a common perception that somethings causes sim lag when actually they don't, for instance, things like particles may caused lag on your viewer but infact have virtually no real effect on a sim as its something created in the SL program your using on your PC, the server never has to render those graphics. 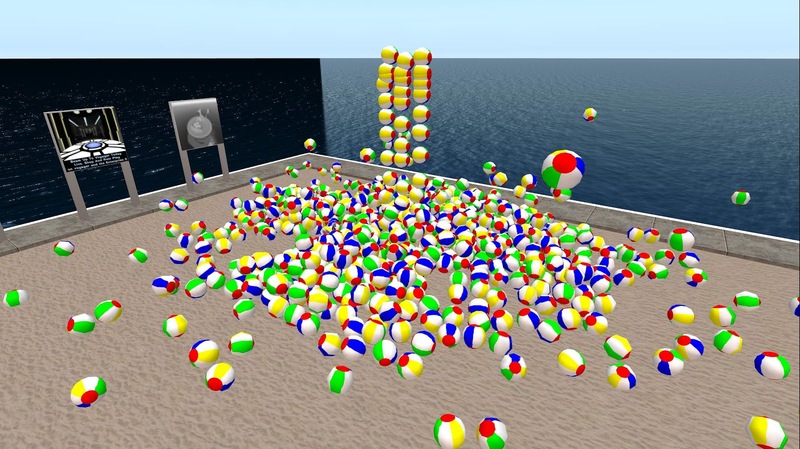 So the sight of tons of beach balls all rezzing at once and Capt. Bigmoe whitfield standing between them in the sandbox would have got most people in a frenzy shouting "Its going to create lag", but in fact is was the anti-lag division doing a test which barely registered a blip on the system. Lag meters stayed steady and in the black. It aptly demonstrated not all is as it may seem with regards to lag. LOL! my balls out, that was good there. yep demo's can be done on request, especially since I am on LOA.